And if anyone learned this the hard way, I assure you, it was me. Flashback: 2012. Before I made the move out west, I lived in Chicago and worked as a digital strategist at a small PR firm. 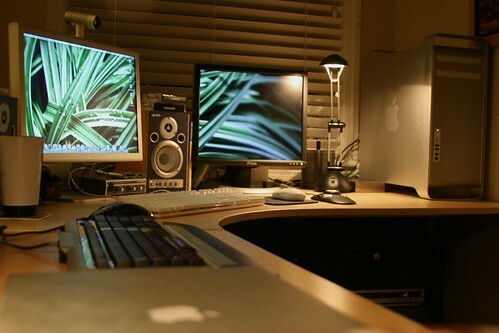 A typical day was about 12 hours: 8-9 hours spent at the office, about 3-4 hours put in from home each night. As much as I loved being in these two spaces, a critical element was missing from both: a proper chair. Slouched, twisted, turned, bent—I was all of the above, all of the time. Even at max height my office chair was still too low, and I found myself using my elbows to prop myself up on the L-shaped desk. At home, I’d lie in bed, scrunched in an awkward, neck-stressing position that was anything but good for my body. But I couldn’t help it—even when I wasn’t doing work, my MacBook Pro still glistened and glowed. Because when work was done, it was my time. I had emails to send. Photos to edit. Blogrolls to catch up on. 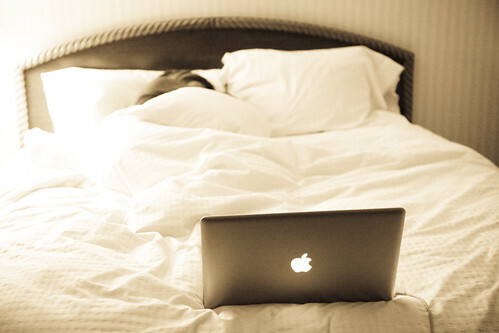 I was on my laptop all the time, and my body fell victim. Everything hurt. And I cried, a lot. Just as the daily pain began to reach a whole new level of unbearable, I received the warning that I needed—the final straw that broke the camel’s back, if you will. While getting a massage, the therapist suddenly seemed alarmed, and continued to deeply rub my right shoulder. Worried myself, I asked him if I was really tight up there. That, my friends, was the turning point. So, I listened to her. And I never looked back. Upon moving to LA and starting at Highly Relevant, I made creating a proper workspace an absolute necessity. And luckily, the HR team is super cool, so they didn’t think I was borderline crazy when I pulled a Goldilocks and tried every chair in the office. First, I tried to make the standard Ikea office chairs (aka the ones that cause no problems for my coworkers) work for me. Countless support pillows and height adjustments later, I came to the realization that I still wasn’t getting enough support in any of the right places. 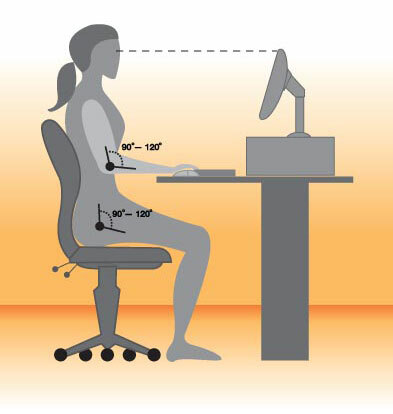 Whether my arms were too long or my desk was too tall or my monitor was too low, it just wasn’t working. Next up: the exercise ball. I figured that, free of artificial support, my body would settle into a naturally comfortable, self-supported position. And it did. It worked great, and I felt my back becoming stronger each day. However, spending entire days on the ball was tough, and I could feel my spine was arching and my shoulders rounding forward. The tension was back. Finally I grabbed a tiny, green outcast of a chair that was inexplicably taking up space in a corner of the office. Slim, short, and armless with a backrest that only reaches mid-back, it somehow works just right for me. It may have taken almost a full year, but Goldilocks finally found her chair. Remember though, building a proper workspace is only half the battle. It is just as important to keep your body fluid and loose during the long workday. To do that, here are some office-inspired exercise tips to help keep you feeling amazing, even when putting in countless computer hours. Being in Westwood, we have a beautiful area surrounding us to explore. I’ll always find time to run a few errands or take a quick walk around the block during the day. It’s not only great on the body, but great on the mind, too. You’ll feel refreshed, all around. And by that I mean don’t be ashamed to do a few bodyweight exercises or stretches throughout the day. Trust me, the pain of dealing with a bad back is way worse than the slight embarrassment of an awkward stretch. Here’s a good guide that includes some pretty entertaining video demonstrations, and another that outlines how to get the most out of your time spent at the office. Malorie Janasek is the Director of Social Media at Highly Relevant. When she’s not behind a computer, you can find her—camera in hand—exploring and capturing the world.